I'm growing so tired of Yelp that I hate myself every time I use it. But! It's hard to find another food recommendation app that's quite as comprehensive. 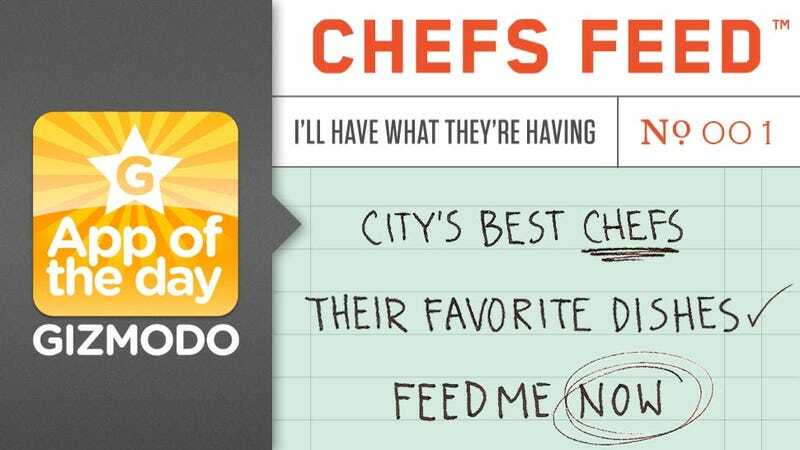 Chef's Feed isn't as all-encompassing, but it one-ups every other food app by showing you the food that chefs—AWESOME CHEFS!—like and eat. It's a restaurant guide app that distills recommendations by only showing you what the best chefs in your city eat. It's like being friends with these star chefs and texting them for recs every time you want to eat somewhere! You can search by chef, search by dish, find dishes per your location, see what the chefs in your city are tweeting at the moment, mark dishes off your to do list, rate them and more. Chef's Feed only supports the big cities—New York City, Los Angeles, San Francisco and Chicago—but within those cities are an ace list of chefs—seriously it's a who's who list—that tell you what they love. It's so smart, I can't believe no one else has done it yet. Think about it, not only do these people make food for a living, they're pretty much the best at what they do. Wouldn't you trust Mario Batali or Thomas Keller or David Chang more than you would Tom S. from Long Island? You're crazy if you wouldn't. The recommendations are BOSS. Sure, they tend to be finer-than-typical-type dining places but for foodies who savor every dish they eat, I can't imagine a more reputable—heck, definitive—way to recommend restaurants. The ability to check off and rate dishes you've had adds a fun layer to the app too: I want to eat at every single one of these places and they'll keep track of it all. And lastly! Aside from the chef's recommendations, by combing through the list of chefs' restaurants, you have a list to tackle there too!